President Obama’s new order instructs federal agencies to design new strategies for hiring, promoting and keeping workers of “diverse” backgrounds. The diversity the government is seeking is not diversity of ideas, outlooks or work experiences. In contemporary political parlance, “diversity” refers primarily to the color of one’s skin and not the content of one’s character. The executive order says the federal government “must create a culture that encourages collaboration, flexibility and fairness to enable individuals to participate to their full potential.” In the name of “fairness,” however, the government will intensify programs that discriminate against white Americans by extending special privileges to everyone else. The order also says that “attaining a diverse, qualified workforce is one of the cornerstones of the merit-based civil service,” though merit and ability are not the metrics of choice when measuring success in diversity-driven career programs. Thus, the Washington Times has clearly adopted the position that any increase in "diversity" equals a loss for Whites. This argument is one that is traditionally employed by opponents to affirmative action who make the fatal mistake of assuming that "diversity" can not include both Whites and minorities simultaneously. On the contrary, diversity initiatives are not a zero-sum game where one White person is removed for each minority applicant who is approved. Whites are as much a part of diversity as anybody else. Therefore, this first point from the Washington Times editorial does not pass the sniff test. It is rather bizarre to see such a clear opponent of affirmation action actually use quotas to support their argument in an affirmative action debate because opponents to affirmative action HATE quotas. They despise quotas. And, indeed, it is true that the Supreme Court declared quotas illegal back in the 1978 landmark case Regents of the University of California v. Bakke, so affirmative action opponents actually do have a valid reason to be against the use of quotas in the diversity debate. So how, then, can the Washington Times justifiably make a quota-based argument here when it says that Whites are "underrepresented by around 4 percent?" If quotas are illegal, which they are, then it doesn't matter what the percentage of the White civilian work force is compared to the percentage of the White federal work force. That argument is moot. The only way that such an argument can be relevant to this debate is if we agree that we should be allowed to use quotas in order to bring the White federal work force (66.2%) into parity with the White civilian work force (70.0%). Surely, the Washington Times would not dare to sign-off on such a quotas-based approach to solving the diversity problem in the federal government. During the 2008 presidential campaign and in the initial months of the Obama presidency, there was great enthusiasm for the concept of post-racial America. Mr. Obama’s historic election was viewed as a watershed for the issue of race relations. People thought that finally a national dialogue could be commenced on the issue free of guilt and recriminations. 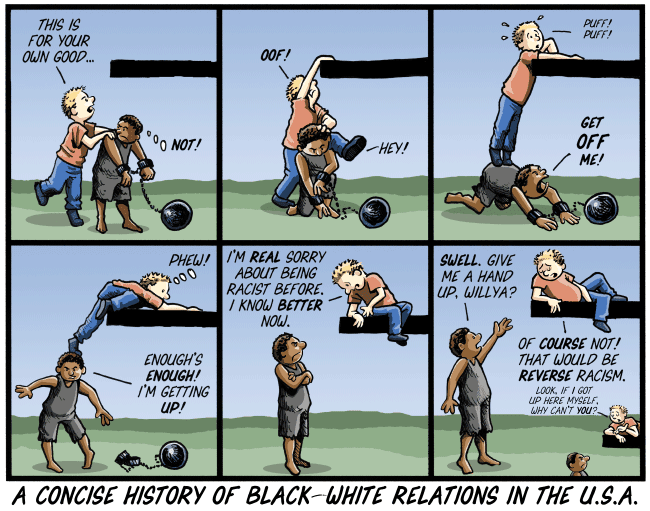 Wanting to turn the page on racism in America is, of course, a noble and worthy pursuit, however, merely acknowledging the mistakes of the past, without actually taking any actions to correct them, misses the entire point of turning the page (as the cartoon above demonstrates). In other words, it is not enough to simply point at the election of one Black President (out of 44 Presidents) and think that this somehow makes everything ok. It doesn't. It's a good start, but if we're trying to actually improve race relations in America then we have to be willing to have an uncomfortable discussion about the big picture. A large part of this big picture discussion is the ability of Blacks and other minorities to enjoy the same access to employment, home ownership, and education that Whites have enjoyed since America was founded. President Obama's Executive Order to increase the diversity of employment within America's federal agencies is one example of taking action in the right direction. Until more actions are taken towards the same effect, helping Whites to feel less guilty during our big picture discussion -- a point that the Washington Times suggests is paramount to actually affecting change -- not only misses the point of the discussion but it also fails to actually take any action towards improving minority access to the aforementioned areas in our society which are still unmistakeably plagued by racial disparities, even in this so-called "post-racial America."